If you haven’t personally been stuck with a dead car, you probably know someone who has. It happens quite often, you leave a light on unknowingly, and come back to a lifeless battery. 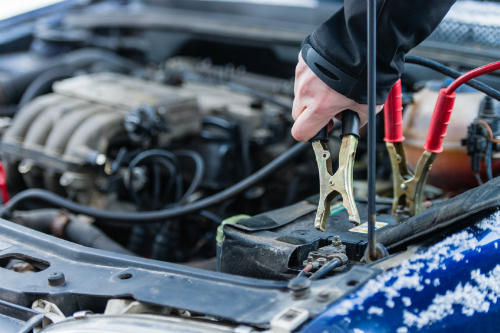 If you don’t have roadside assistance, then this tiny issue can turn into a big one quickly, especially if you don’t know how to jump start a car. Below we’ll explain how to jump start a vehicle, and tips on what backup plans you should consider investing in. So, if you ever walk out to a dead battery, at least you’ll know what to do! Investing in a roadside assistance plan through your auto insurance company is a great way to ensure any issues you face will be handled. If you have a new driver in your family, you may want to consider putting them on a plan, so there’s always someone on call who can help them with a dead battery or any other issues. Park the two cars close together, but make sure they don’t touch. Then, turn both cars off. Connect the positive jumper cable (usually red) to the positive terminal on the “dead” battery. (Typically, the positive battery terminal is marked with a plus sign, while the negative is marked with a minus.) Make sure the positive cable does not touch anything metal except for the battery terminal. Connect the other end of the positive cable to the positive battery terminal on the vehicle providing the jump. Connect the negative cable (usually black) to the negative terminal on the vehicle providing the jump. Connect the other end of the negative cable to an exposed metal part of the vehicle with the dead battery. (Unpainted components like brackets, bolts, etc., provide the best ground). Start the “booster” vehicle and let the engine idle for a few minutes. Start the disabled vehicle. If it doesn’t start, you may need to check the cable connections. If the battery is a few years old or has been dead for a a few weeks, you may consider revving the engine a bit to speed up the charging process. If that doesn’t work, there may be some other problem with the car, and you’ll need a mechanic’s help. If the car with the dead battery starts up, let it run with the cables attached to both cars for at least 20 minutes. Remove the black (negative) cable from the ground on the previously disabled vehicle (vehicle is still running). Following the reverse order of the connecting process can help prevent sparking. Remove the other end of the negative cable from the battery of the vehicle providing the jump. Remove the positive cable from the battery of the vehicle providing the jump. Remove the positive cable from the previously disabled vehicle. The jump is meant to restart the disabled vehicle, not to recharge the battery. So, it may be a good idea to put the jumped battery on a battery charger, which you can buy at an automotive store, as soon as possible to help ensure that it’s charged to full capacity. If you’re unsure about the long-term health of your battery, consult a mechanic or a professional at an automotive store for advice. We hope you found this helpful! Remember, if you have a vehicle that doesn’t run, and you need it transported to a different location, contact us at Auto Transport 123!